Virginia Clemm Poe wrote this carefully-penned acrostic valentine for her husband, Edgar Allan, in 1846. The first letter of each line spells out his name. The tradition of writing romantic acrostics was a venerable one by the time Virginia put pen to paper. (Here is an entertaining story about a trend in anonymous valentine acrostics among the settlers near Williamsburg, Virginia, in 1768.) While commercially produced valentine cards were increasingly available in 1846, it wouldn’t have been unusual to send a hand-written note on plain paper instead of a printed card. This poem is held in Special Collections at Baltimore’s Enoch Pratt Free Library. You can browse their Edgar Allan Poe digital collection here. 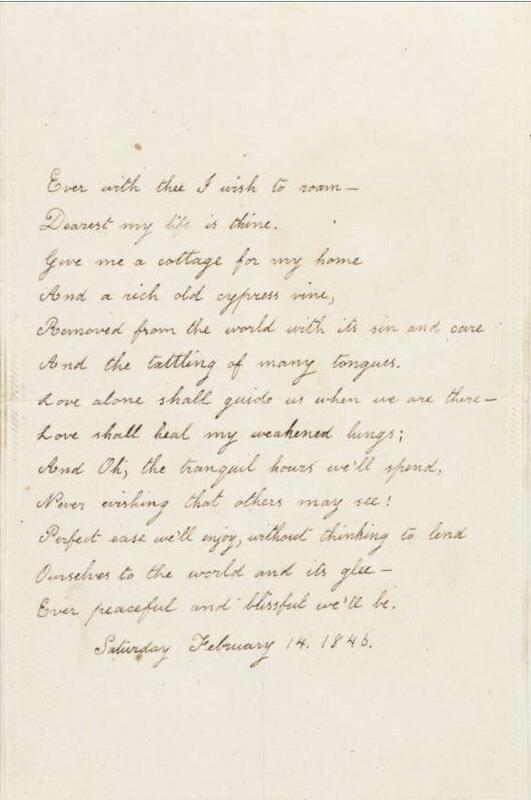 Valentine poem: Virginia Poe to Edgar Allan Poe, February 14, 1846. Enoch Pratt Free Library Digital Collections. Update, Feb. 18: This post has been updated to clarify which letters spell out Poe’s name.